Another night descends on the Exiled Lands. Will you survive this year’s harvest? Love it or hate it, we got a lot of really valuable feedback from the last time the Night of Lost Souls rolled around, and we’ve taken that feedback into consideration with this second attempt. We’re sure we got it right this time! “For an Easter event, shouldn’t you do something Easter-y,” you might say. Obviously, you haven’t heard of “Påskekrim”, a Norwegian Easter tradition. During Easter we watch a bunch of crime and mystery shows during the Easter Holidays. We thought The Night of Lost Souls would be the perfect backdrop to give the game that crime-y atmosphere. Only Easter isn’t just about consuming crime shows and novels. It’s also about consuming treats and goodies found in tiny containers hidden around the environment. 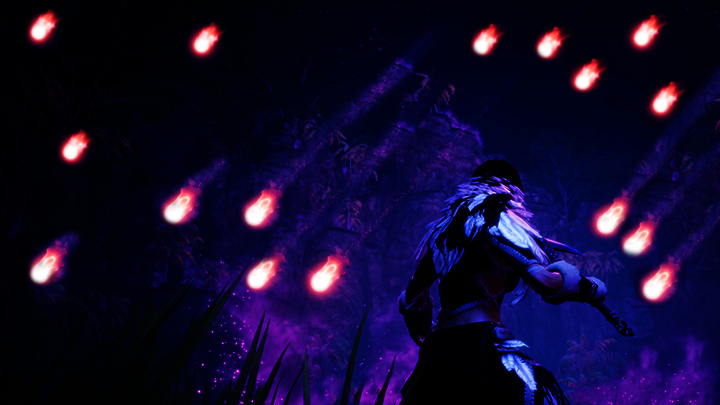 So, we decided to up the amount of meteors, to a near constant rainfall of those purple, soft-glowing rocks. It’s like an Easter egg hunt, except everyone gets a prize! ← Conan Exiles is Free This Weekend!